While I do not consume any animal products (as a vegan), I have no problem cooking meat-based dishes for my family. I do not believe in imposing my diet onto others, although most of my home cooked meals are mostly vegetable-based, sometimes my mom do incorporate a piece of fish or chicken here and there, just to vary her meals a bit. When she had too much meat in one week, she just consumes more greens the following days, and vice versa; so, when I see that she hasn’t been eating much seafood, I tend to ‘treat’ her to a cooked dish that includes either shrimps or fish. Just no mollusks, since they are not her thing. I was intrigued in the making of fried rice. Sounds simple enough, right? Just dump some day old rice into a wok, drizzle in some soy sauce and seasoning, throw in whatever proteins and mixed vegetables, give everything a stir or toss and it is ready for plating. However, if you want to make a balanced dish, you do have to invest in several steps. First, you have to cook the protein, vegetables, eggs (if used), and vegetables all separately as each component has different cooking time. If you just blend everything together simultaneously, some most be cooked to death (mushy), while others are ‘al dente’. 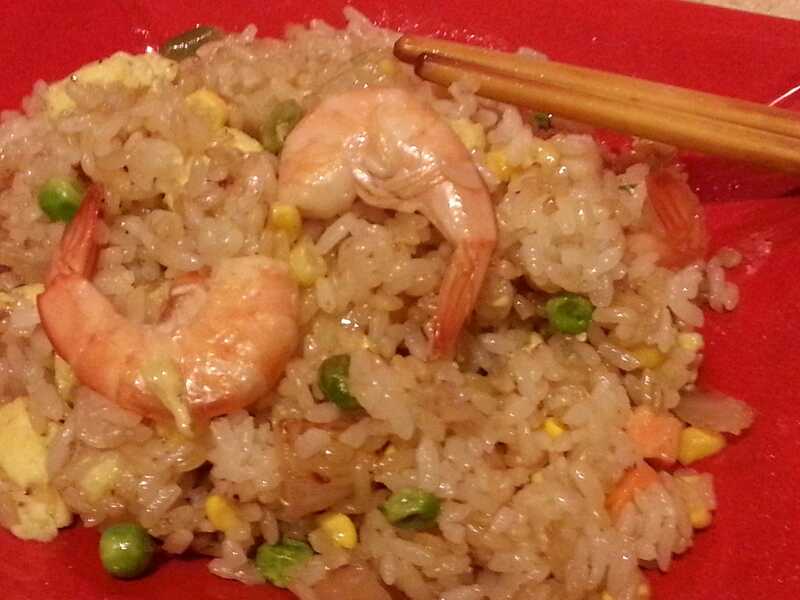 I started off with cooking the proteins by sweating a bit of garlic, diced onions, and then add in the shrimps. I cook the them until they are just pink and remove them. Then, I cook the rice, as in just ‘dry stir fry’ them, just to break up the grains a bit. After I remove the rice off the fire, I cook the eggs until barely solidified. Like a scramble. Take that off as well. The finale step is to add in some more oil, first put in the rice, then the defrost vegetables, proteins, and finally the eggs. Drizzle in some soy sauce, a bit of oyster sauce and chili sauce if you want to kick it up a notch. Stir fry everything in high heat for ‘wok hei’ (a term in referring to the flavour, tastes, and “essence” imparted by a hot wok on the food) for 2-3 minutes. Sprinkle in some cilantro or green onions and you’ve got a dish that suggests carbs/proteins/vegetable all compacted into one balanced plate. Best of all, it just taste so much healthier than your local take out version because you could control the amount of vegetables, oil, and sodium to your heart desire.